Our Playground Leaders Busy At Work Setting Up For Another Active Playtime. 20 Minute Burst Of Penalty Shoot Out During Active Week! We Love To Begin Our Day With Wake Up, Shake Up. Our Playground Leaders Are Easily Identified As They All Wear High Vis Jackets. 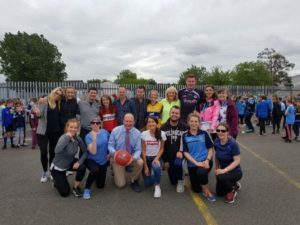 At St. Fiachra’s SNS, We Support And Celebrate Victory Achieved By All Children Whether It Happens In School Or Outside Of School. We All Participated In A Campaign To Promote Active Week At St. Fiachra’s SNS. At St. Fiachra’s SNS, We Follow A Timetable For The Playground So That We Can Maximise The Use Of Each Zone. Well Done To Our Medal Winners Michael, Conor and Harry. We Are Very Proud Of You! Well Done To All Of The Children Who Ran At Santry This Week. We Are Very Proud Of All Of The Children Involved In The Event. Check Out Our 4th Class Children Who Received Training From The Leinster Rugby Coaches!! Our Senior Girls Gaelic Team Demonstrating Learning Grit During Training Today! Senior Girls Camogie Team Who Reached The Semi Final Yesterday. Well Done Girls! !